The grass to the right before Turns 5 and 16 have been replaced with asphalt. The asphalt on the exit of Turn 15 has been extended. The additional curbs behind the apex curb and Turns 6, 7 and 8 have been lengthened by 16.40 feet at each end. An area of artificial grass has been laid behind the apex of Turn 7. A 3.28 feet wide strip of artificial grass has been laid behind the curb around the inside of Turns 10 and 11. The verge on the right between Turns 8 and 9 has been leveled. The curb, artificial grass and asphalt run-off area on the right after Turn 9 have been extended as far as the 'oval' track loop. The guardrail on the right before Turn 10 has been re-aligned further from the track. 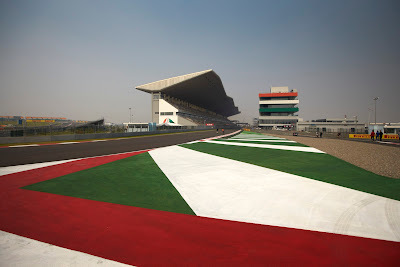 The Buddh International Circuit is a 60-lap race with each lap being 3.185 miles long, making it a 190.916-mile race total. The highest point of elevation is 45.931 feet and the width of the track varies between 45.931 and 65.616 feet. The fastest lap was set here last year by Sebastian Vettel (Red Bull) with a time of 1:27.249. The race is held in Great Noida, a community planned in the 1980s, and is an extension of the planned urban region of Noida, incorporated in the 1970s and designed to accommodate the rapid growth of New Delhi. Noida is an acronym for New Okhla Industrial Development Authority, the managing authority of the development. 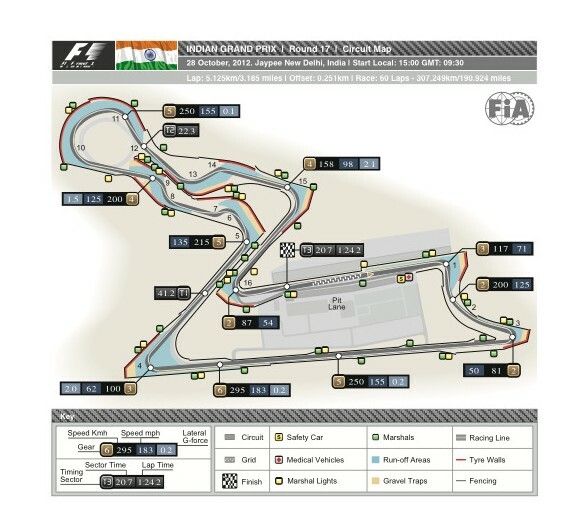 Buddh International Circuit features several challenging changes of elevation - none of which are entirely natural. Four million cubic tons of earth were bulldozed into place during circuit construction. One of the most notable sections of the Circuit is the multi-apex Turns 10 and 11. It has been likened to Spoon corner at Suzuka and also to Turn 8 at Istanbul Park. Unlike both of those, it is a clockwise turn. The first 13 races of 2012 were all clockwise circuits, and Buddh is the only fully clockwise circuit of the last seven races. Marina Bay (Singapore) , KIC Yas Marina (next weekend in Dubai), Circuit of the Americas (Austin,TX), and Interlagos (Brazil) are all counter-clockwise with Suzuka (Japan) being a figure eight layout. This presents drivers with new physical demands, especially on their upper body, head and neck areas as they go through turns in the opposite directions. India is the first country to have its inaugural race won by the reigning World Champion (Sebastian Vettel) since Michael Schumacher managed the feat at Bahrain's Sakhir Circuit in 2004. Since then, Formula One has gone to Shanghai, Istanbul, Valencia, Singapore, Abu Dhabi and Korea without the man with the No. 1 on his car taking a podium. India was Vettel's ninth and final victory of the 2011 season. He had wrapped up the 2011 Drivers Championship two races earlier at Suzuka. This did not diminish his motivation as he went on to take pole positions in the next two races; however, a puncture in Abu Dhabi led to his only retirement of the season. In the next race, which was the season finale, a gearbox problem relegated him to second behind team-mate Mark Webber. Vettel's victory in the 2011 race was his first F1 Grand Chelem. For those not in the know, there are four conditions that must be met to achieve this feat: 1) the driver must win pole 2) The driver must win the race 3) the driver must secure the fastest lap and finally, 4) the driver must not lose the lead at any point during the race including pit stops. It's a huge accomplishment and one which Vettel repeated earlier this month in Japan. Vettel has been leading grands prix for 145 consecutive laps. He took the lead from Lewis Hamilton (McLaren) midway through the Singapore GP and was in first place from lights to flag in both the Japanese and Korean grands prix. Alberto Ascari holds the record for consecutive laps led with 305 during the 1952 season. Webber finished second in Korea, following Vettel over the finish line to make it the first 1-2 finish for any team in the current season. Red Bull Racing achieved it three times in 2011 but 2010 was the last time any other team has managed this feat. During that season RBR finished 1-2 four times, McLaren three times, and Ferrari twice. Watch the Indian Grand Prix live on SPEED Sun Oct 28 at 2:00am ET.